It’s happened. Your beautiful, pristine, perfect surfboard has been damaged; surfboard repairs should be carried out by professionals to give your favourite stick longevity. We all know how it feels. We feel your pain. All you want to do is ignore it, finish that surf, get amongst it and worry about the ding later: don’t do it. Come and see us at Manly Surfboards, as we will repair your board like new or as close as we can to new. If water gets below the fiberglass and into the blank, you have a seriously large problem. Focus on ding repair right now. If there’s any chance of water getting in, get the board out of the water, put it upside down to ensure water drains away and dry it out as well as possible. At Manly Surfboards we love ding repairs and the challenge of providing the best repairs available to MAN 🙂 and happy to help you out with your repairs. Professional surfboard repairs ensures your board comes back looking like new which not only makes you happy, it retains the resale value of the board. We can also deal with broken fins, fin plugs, fix surfboard delamination, do complete restoration jobs, fix cracks, chipped noses and swallow tails.Repairs are necessary to stop further damage and help maintain the value of your board. With EPS core board, it is even more important to repair as the foam will absorb the water. With a professional repair the damage will often be un-detectable making you board look brand new again. UV resin is the easiest and fastest fix – but it’s not a long term fix. Sun cure resin can be applied immediately and will harden in sunlight. Manly Surfboards sells resins that dry in about 5 minutes, are easy to manipulate into any ding shape and will get you back in the water quick. UV resins also come in as fibrefill with fibreglass strands mixed in to give extra strength. Either transparent or white to best match the colour of your board. 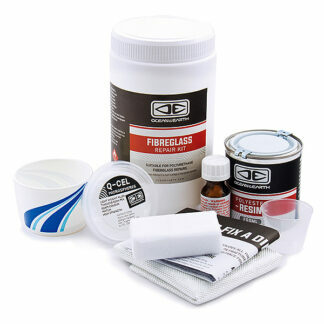 This will give you the most professional and long-lasting finish but requires a careful, several-stepped process. The instructions are well laid out for you and include filling the ding and covering it with resin and sheets of fiberglass, mixing various chemicals and taking it slowly. But if you surf near rocks a lot, or you’re just sort of clumsy, it could be worth practicing with the repair kit – you’ll get better at it each time!